Beautiful picture! Especially the pink flower on the road! lovely catch of the rain drops!! I love the photos! Nice capture of the rain and the last one with the vivid pink! Sarah, Awesome girl!! !Loved the capture so much..
Fabulous !! "kumaranashan-nte veena poovu ennu venamenkilum parayam lle? 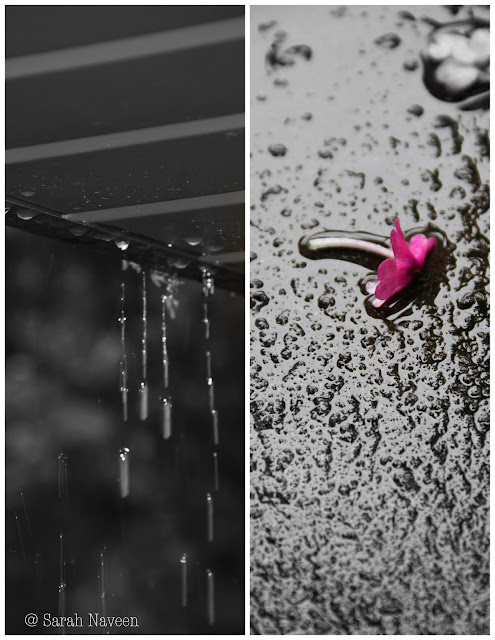 pakshe athil mazha illallo..
Keeping it black and white with that pink flower is a great idea .. beautiful shot! Wowwww... Beautiful !!!!!.. Amazing shots dear !! Lovely photo with a thought provoking message. Looks great. Oh my .. looks wonderful dear. Beautifully captured and presented, Sara! Veena poove adipoli!! Gorgeous pic sarah they speak million!